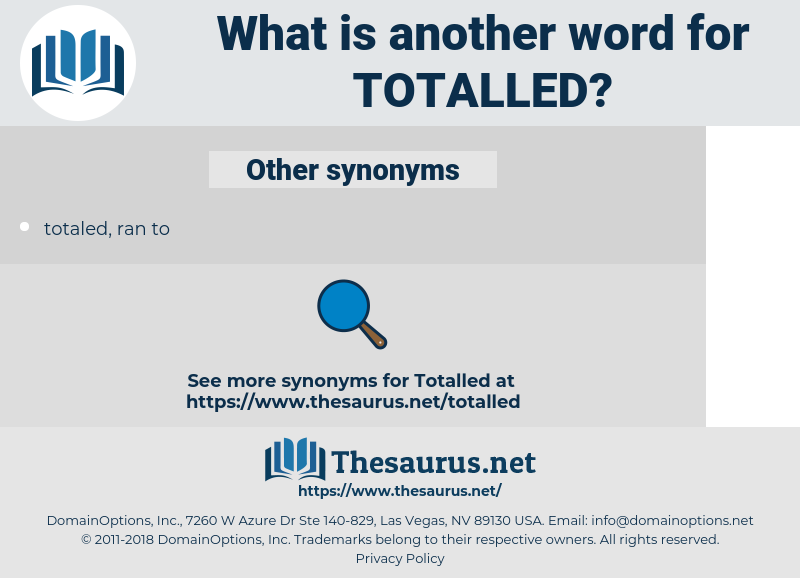 What is another word for Totalled? 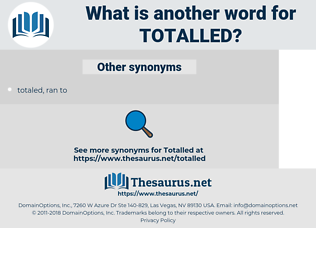 o, Equalled, topped, calculated, represented, Everything, gross, Boasted, Consisted, constituted, Summed, elevated, supported, Encompassed, touched, increased, involved, Accounted, measured, included, Contributed, consumed, correspond, Corresponded, portrayed, Attracted, added, Obtained, reflected, Came, realized, traded, Averaged, recorded, Ranged, attained, Coincided, Achieved, Undertook, Exceeded, matched, sat, shared, Worked, combined, Commanded, Filed, Spanned, fulfilled, Protested, Counted, featured, Acceded, joined, Declined, Numbered, expected, Ascended, spoke, turned, assumed, HIT, lf, expressed, Soared, peaked, repped, Conformed, Relied, Reached, Stood, marked, Grew, Yielded, earned, Entered, Invaded, Depended, fell, Had, intended, Climbed, formed, Brought, posed, raised, be, Was, Were, Took, Arose, Jumped, Went, Succeeded, dropped, rose, S, Met, Became, Gained, Meant, Seemed, showed, Ran, struck, 'd. wholehearted, completed, valued, Tabulated, afflicted, represented, estimated, accomplished, touched, Accounted, measured, portrayed, Progressed, added, Promoted, Penetrated, diagnosed, demented, Constructed, Supplemented, realized, realised, attained, Achieved, depicted, combined, endorsed, fulfilled, Acceded, joined, Compared, turned, crossed, HIT, peaked, grown, Reached, Stood, Compromised, burdened, fallen, compounded, Reared, cultured, Been, Succeeded, risen, Met, Farmed, struck.